Cairo, Egypt (CNN) -- The Arab League voted Saturday to back a no-fly zone in Libya and is asking that the U.N. Security Council impose the measure, officials of the regional body told reporters. "It has one goal: To protect the civilian population," Amre Moussa, the body's secretary-general said. "We will inform the U.N. Security Council of our request to enforce a no-fly zone over Libya," Moussa said. "The U.N. Security Council should decide how it will be enforced." Youssef bin Alawi bin Abdullah, Oman's foreign minister who joined Moussa to answer questions, said the no-fly zone would be a preventive measure and would have to be stopped immediately when the Libyan crisis ends. Are Libyan rebels losing momentum? He said Arab League members have reservations about military intervention, but said all countries agreed that a no-fly zone must be imposed urgently to protect civilians. "We hope the Libyan authorities will respect a no-fly decision," he said. "Be assured the Arab countries will not accept the intervention of the NATO coalition." Moussa said the league also voted to open channels of communication with the Transitional National Council, the Libyan opposition's newly formed administration, and that any talks with that body would be on a humanitarian basis. "We are giving them legitimacy but we're not giving them political recognition," Moussa said. "We are prepared to help evacuate any Arab nationals from Libya regardless of their nationality." The Arab League also called for immediate humanitarian assistance and an end to the bloodshed in Libya, where civil war has broken out between forces loyal to leader Moammar Gadhafi and a tenacious opposition movement. The White House cheered the League's announcements and stressed it will continue to pressure Gadhafi, support the opposition and prepare for "all contingencies." "We welcome this important step by the Arab League, which strengthens the international pressure on Gadhafi and support for the Libyan people," White House Press Secretary Jay Carney said in a statement about the Arab League's no-fly vote. Opposition forces made strides in the early days of the rebellion, but Gadhafi's military has recently gained strong momentum. The military has been pounding the key oil port of Ras Lanuf, once in the hands of rebel forces, and has taken control of towns such as nearby Bin Jawad. 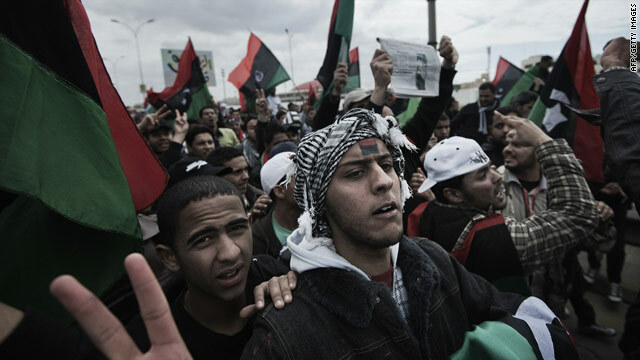 The Gadhafi government appears intent on retaking all territory from the opposition despite growing international pressure. The League was meeting at its headquarters in Cairo, while hundreds of demonstrators outside urged the international community to step up support for Libyan opposition groups. Pleading for international help as they continue to lose ground topro-Gadhafi forces, rebels are asking for a no-fly zone that would theoretically thwart airstrikes. No-fly zones are areas where aircraft are not allowed to fly. Such zones were put in place after the Gulf War in southern and northern Iraq as a check on the forces of the late Iraqi leader Saddam Hussein. Western powers have said any action by the international community, including a no-fly zone, would have to have regional support and a clear mandate from the United Nations. U.S. President Barack Obama said Friday that he "won't take (the) decision lightly" on whether to use military force, including helping to enforce a no-fly zone, saying it is critical to "balance costs versus benefits." While France has recognized the National Transitional Council as the sole representative of the Libyan people, the European Union was more restrained Friday, saying it "welcomes and encourages the interim transitional national council based in Benghazi, which it considers a political interlocutor." German Chancellor Angela Merkel was even more cautious in her approach to the council, calling it a possible interlocutor. Britain's Foreign Office issued a statement after Saturday's vote, saying, "We welcome the Arab League's decision to make contact with the Interim National Council," which the government sees as "valid interlocutors." The statement also said that no-fly zones are "one option being considered as part of international contingency planning to respond quickly to events on the ground as they develop. This planning does not pre-judge any particular outcome." French President Nicolas Sarkozy said in a news conference in Brussels, Belgium, Friday that "we consider the National Council based in Benghazi as the proper interlocutors for Libya and they need to be recognized as such and encouraged." In another diplomatic development, the U.N. humanitarian coordinator for Libya, Rashid Khalikov, arrived in Tripoli on Saturday to discuss access for humanitarian aid. "The international aid community has expressed concerns over the very limited access to various areas in Libya, including those places where heavy fighting is taking place," Khalikov said. About 260,000 people, mostly third-country nationals, have left Libya for neighboring countries, primarily Tunisia and Egypt. In response to the crisis, the United Nations and its partners launched a "flash appeal" seeking $160 million "to assist both those leaving the country and those expected to need humanitarian assistance inside Libya," the Office for the Coordination of Humanitarian Affairs said. Meanwhile, the Libyan government on Saturday took journalists to the eastern city of Bin Jawad, where the government ousted rebels about a week ago. CNN's Nic Robertson said he saw fighter jets in the sky but he didn't see them engage in strikes. He saw some structural damage, such as a blown-out police station and damage to a school and houses, including a Katyusha rocket embedded in the wall of a house. Some stores were closed and others had been looted. CNN's Reza Sayah and journalist Mohamed Fadel Fahmy contributed to this report.